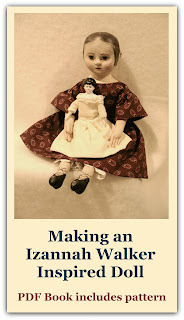 Imagine my thrill when I opened my e-mail up and attached to the e-mail were these wonderful pictures of an original Izannah Walker doll costumed as Little Red Riding Hood? Thanks so much to the private collector who sent these pictures along and gave permission to share them here with you all. The owner says, "Little red riding hood was made after she applied for her patent. Her label is under her shoulder plate. Despite being later you do not see many of them." Look at those green boots! Interesting shoulder plate compared to the others in the sidebar. Not your typical side curls hair design. Isn't she so sweet and sincere? What a gift!!!! And what a unique IW. Almost as if she were custom made for some little girl? Very nice, thankyou so much for sharing her Dix. 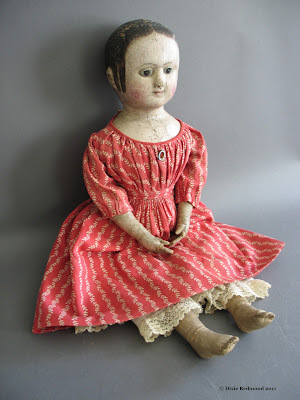 Oh My, what a wonderful sweet person to share their lovely doll with us, it resembles the one that has been shown before that i think the author said it was thought that IW's sister made it. In the cream dress with flowers? Such a treat!! Thank You so much Dix, and the very giving owner of this darling doll!!! Ooh, I love this one, too! I'm so glad you were gifted with photos of this wonderful doll. Thanks for starting this IW site. What a source of inspiration. I visit often.